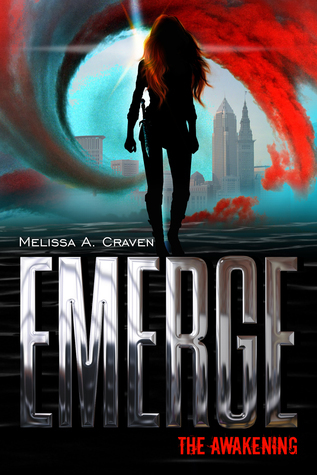 Emerge is yet another book that is the epitome of a disappointment. I saw amazing reviews, read an interesting premise, and fell in love with that gorgeous cover – but the words within the book itself might have just destroyed all hope. I’ve read books with cheesy language but a good story line or developed characters that redeemed the book – Emerge is not one of those. Not only is the language trivial and almost worthy of killing brain cells, the plot itself is nonexistent . Add that to a main character I want to strange for being the normal Young Adult trope curvy, green-eyed, ginger with special powers, the stereotypical parent issues, and all around heart throb and I wanted to poke my eyes out. This could be coming off as a little harsh, even I think so – but all it would have taken to change my view point was a little more depth and development. Everything was too one dimensional. The potential I saw within Emerge started to wither away the moment I began reading. I mean, Allie – our main character – literally runs into Aidan in the most ridiculous set up ever. Is it possible to do anything original anymore? Emerge isn’t a total loss, despite what I think – it still had some pretty interesting ideas that made me curious. Allie isn’t like normal girls (big shock there). Allie’s touch makes people uncomfortable, disgusts them even. So, when she basically tramples Aidan on a trail run and he doesn’t react – viola, the story is born. I don’t want to spoil you guys as to what was actually going on within all this weirdness, but I can sum it up fairly easily: Ginger girl finds out she’s special and not a freak, ginger girl falls in love with supernatural boy who tells her she isn’t a freak, chaos ensues. It could have been done very well. It had the potential to go somewhere and do something unexpected. Instead, the writing is awkward, the pacing is far too slow, and the entire thing is more predictable than Twilight and every dystopian book out there’s love child. Emerge is a very boring and ultimately confusing story that isn’t worth your time, effort, and money. Underdeveloped characters, sketchy plot holes, and contradictory monologues run rampant in this failed attempt at rewriting every Young Adult book ever. Plagued by monotonous backstories for minor characters, information dumping, and all existing stereotypes for YA Lit , Emerge Is nothing more than another black mark on my long list of bad books. It was so depressing : ( I really wanted to like it.. I mean, look at that cover? But alas, the book was the epitome of disappointment.